Fencing, an art form rather than a brute, aggressive sport, is now here at SFA. Lead by Julianna Calkins, junior major, this sophisticated sport is available Monday nights from 8 to 10 p.m. in the HPE rock wall room. Today’s modern fencing originated in Spain in the 18th century with the development of the three different types of weapons: foil, saber and epée. Foil targets the torso, including the back excluding the bib or the arms. Touches are scored only with the tip. SFA’s Fencing Club uses this foil technique. Only either fencer can score a single hit at one time. Equipment in fencing includes a form-fitting jacket, an underarm protector, gloves, knickers, knee-length socks, flat-sole shoes, mask, bib and a chest protector. In foil, a lamé is also used. This is a layer of electrical material worn over the fencing jacket that covers the target area. Since the object of the game, or sport, of fencing is to hit the other person without being hit, it is a sport based on dueling practices. However, with the many rules of touching, attacks and technique, it is possible that the judges miss something because they were focusing on something else. During a match, the judges, footwork and technique aren’t the only thing a fencer needs to remember. According to Calkins, it is important to remember to rely on instinct and the footwork, technique and blade work that a fencer has been working on. Fencing, also referred to as “physical chess,” is mostly about analyzing the opponent. It is important, Calkins said, to figure out what the opponent’s strengths and weaknesses are and how you can use your strengths to win the bout. “Fencers should be thinking only how to best maneuver and use what they’ve learned in lessons to win. It’s a mind game!” Calkins said. Audiences also have things to remember while watching a tournament or match. Because of the constant noise that includes blades connecting, coaches shouting and buzzers going off, the audience doesn’t necessarily have to be quiet. However, they can be issued a yellow card, red card or black card. A yellow card is issued for minor things, a red card is more serious and a black card is when a person is banned from the event until the following year. “That’s always a little entertaining,” Calkins said. It is also important to remember that safety is the golden rule of fencing. With all of the protective gear, it is a necessity to remember corrective footwork, lunging and blade work. Self-inflicted injuries include knee damage from incorrect lunging or broken bones, which is rare. 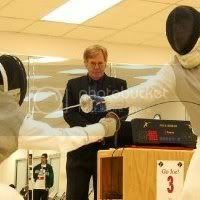 According to Calkins, a fencer may choose to do a fleche, where a fencer runs at your opponent. However, there is a possibility of rolling an ankle while doing this. SFA’s Fencing Club teaches this respect along with the foil technique, finesse, precision and thought. Because Calkins enjoys the traditional aspect of the sport, the club also learns about the specific sportsmanship of the sport. “I like the old-fashioned courtesies it requires, such as saluting before and after every bout, shaking hands with your opponent after a bout, and respecting the person who is directing the bout,” Calkins said. The club’s goal is to become a sports club under Campus Rec and compete with other Texas colleges. However, in order to achieve that goal, certain requirements need to be met such as finances, competition plans and equipment organization. “Our goal is to provide an opportunity for experienced fencers to continue fencing in college and for college students who are interested to try fencing and be able to come and learn basic footwork and blade work,” Calkins said. Calkin’s three-week rule is essential because fencers who come three weeks in a row understand by then if they would like to continue or not, and all level fencers are welcomed.